One of the most popular and well-known tools for learning a language online is Duolingo. Duolingo is completely free, easy to use and makes it a lot of fun the acquisition of a new language. There is a variety of languages you can choose from, including English, Spanish, French, German, Italian, Portuguese, Russian, Dutch, Swedish, Turkish, Japanese, Norwegian, Danish, Polish, Hebrew, Vietnamese, Greek, Ukrainian, Welsh, Hungarian, Swahili, Korean, Romanian, Czech and Chinese. Duolingo is a great example of a straightforward language app. It’s really simple to use. You set up a profile, choose your target language, set your weekly goals (only if you’re brave enough) and off you go! There is an option to ‘test out a language’ when you begin a new language. You can start with the basics or you can take an ‘entry test’ and let the app determine your fluency level. Each course in Duolingo is made up of modules. The modules upon completion are grouped to form the student's language level. Duolingo dictates the order in which you need to complete the different modules, with new modules becoming active only once you’ve completed the previous one. This is also the case with individual lessons within each module. For example you have to complete lesson 1 in order to be able to progress to lesson 2, and so on.There are dozens of sets of lessons at Duolingo called Skills. Some of them include the following: Basics, Phrases, Food, Present, Adjectives, Plurals, Family, Questions, Numbers, Household, Colors, Comparison, Qualifiers, Measure, Clothing, Animals, Prepositions, Dates & Time, Nature, and Medical. At the end of each lesson, you get a progress report that also shows your ‘streak’ – the number of days in a row that you’ve completed.Keep in mind that a user account isn't required to use Duolingo, but it's recommended if you want to keep track of your progress. The lessons include images, text, and audio, and sometimes has you speak into a microphone (if you have one) to test your speaking and pronunciation skills. New vocabulary is often taught with images, and grammar points are explained in little speech bubbles. There are also listening exercises where you need to type what you hear, and speaking exercises where you say what you hear. 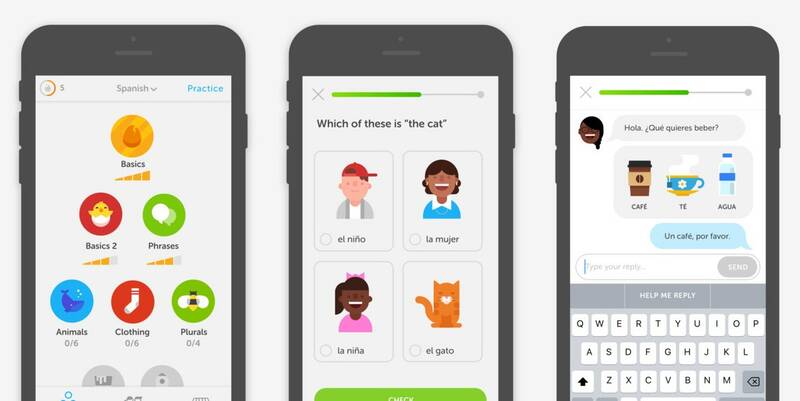 Duolingo recognizes that language learners need to be motivated to make sure they come back to the app and engage in some more language fun. Duolingo is a constructivistic tool that uses several different methods to keep you interested but the most useful is the Gamification .The goals a student can choose from range from ‘casual’ to ‘insane’, depending on how serious one is about learning and how quickly one wants to progress. This works well for those who are motivated by the idea of making a ‘formal arrangement’ with the app. The theory of gamification is applied since you get extra points called Lingots every time you complete one of the goals that you or the application has set, thus increasing the motivation of the learner. It can also attract visual learners due to the fact that a lot of the learning that goes on in Duolingo is visual. There are pictures for learning vocabulary, colours that indicate whether you’re right or wrong, and highlighted tapable text for new words or grammar points.